Babur was also called Zahir-ud-din Mohammad and was related closely to both Chingiz Khan and Timur. At an early age of 12 he became the king of Farghana. He was nourished militarily by the experiences he had from facing the enemies who plotted against him. In 1497 AD Babur captured Samarkand. His ministers pronounced him dead and put his younger brother on the throne. He failed in his attempt to recover Farghana. On his venture to retrive Farghana his cousin Ali usurped his authority over Samarakhand. Babur now was kingdom less. In 1499 AD he was able to capture Farghana. In his early days of succession he had to face many oppositions. In 1497AD Babur captured Samarkand but lost Farghana. In 1498AD Babur lost both Samarkand and Fargana. In 1499AD he regained Farghana and in 1500 AD Samarkand was reconquered the second time. Babur set put for Kabul and occupied it in 1504 AD and ruled till 1526 AD during which he conquered Qandhar and Herat. His attempt to conquer Samarkand which he lost in 1502 AD failed and he turned towards India on a fresh venture. The conditions that prevailed in India at that juncture invited him to set out to conquer India. By 1524 AD he had brought Lahore under his sway. From Lahore he marched to Delhi where he was met by Ibrahim Lodi on the battle field of Panipat. Ibrahim Lodi was defeated owing to the superior artillery of Babur. Babur then sent his forces to occupy Delhi and Agra. Thus started the rule of the Chaghtai Turks who ruled under the name of Mughals. On beginning his rule in India Babur had to face the problems of the Rajputs and the Afghan chiefs. He battled Rana Sanga of Mewar in 1527 AD in the battle of Kanwah. Rana lost the battle. The defeat of Rana Sanga shook the power of the Rajputs. In 1528 AD Babur attacked Chanderi which was held by Medini Rai and captured it. In the year 1529 AD. Babur marched against Mahmud Lodi a brother of Ibrahim Lodi and the battle of Ghagra followed which resulted in the defeat of the Lodis. 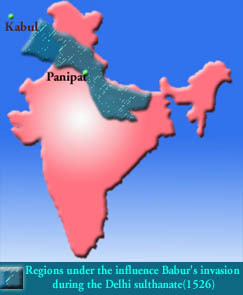 By then Babur's empire extended from Bhera and Lahore to Bahraich and Bihar and from Sialkot to Ranthambhor. Babur died in 1530 AD. He was succeeded by Humayun the eldest of his four sons . At the age of 20 he was appointed the governor of Badakshan. He had contributed his services in the battle of Panipat and Kanwah. After the death of his father he placed himself on the throne of Agra in 1530. Humayun was faced with numerous difficulties. He had to reorganise his army that comprised of mixed races. He faced problems from his brothers, and nobles. The Afghans though defeated by Babur were not vanquished. The rise of Sher Khan and Bahadur Shah of Gujarat was a matter of concern. Above all he had an empire which had yet to be consolidated and administered in a manner by which his authority would be accepted. In 1531AD he set out on an expedition to besiege the fort of Kalinjar. He was not successful in this mission owing to the Afghan mission towards Jaunpur. In the battle of Dourah in 1532 AD he defeated the Afghans. In 1532 AD he besieged the fort of Chunar under Sher Khan and resorted to mere submission. Between the peri od 1535-36 AD Humayun fought wars with Bahadur Shah. Bahadur Shah had annexed Malwa in 1531 AD, captured the fort of Raisin in 1532 AD and defeated the Sisodia chief of chittor in 1533 AD. He was opposed to the Mughal rule and created the circumstances that turned Humayun against him. On the request of Rani Karnawali of Chittor he accepted the request but fell short of his promises. Bahadur Shah captured Chittor. Humayun now had a reason to attack Bahadur Shah. Humayun now besieged the fort of Mandu and captured it. Bahadur Shah who now fled to Champanir which was also besieged and captured . Humayun captured Ahmedabad and Cambay and finally central Gujarat. Humayun then spent celebrating his victory over Gujarat while his administration lagged. This helped Bahadur Shah who with the local chiefs won Gujarat in 1536 AD. Sher Khan had been building himself against Humayun in Bengal and Bihar . By 1536 Sherkhan became the ruler of Bengal and Bihar. In 1537 Humayun attacked the territories of Sher Khan and decided to occupy Bengal. During the period 1538-39 Sher Khan with his military tactics was a threat to Humayun. Sensing his worse position in an area under Sher Khan's control he turned back to Agra. Sher Khan pursued Humayun engaged himself in the battle of Chausa in 1539. Humayun was defeated and had to flee. In the year 1540 Humayun after having reached Agra again fought a battle against Sher Khan in the battle of Kannauj. Humaun lost the battle and had to abandon his throne. He was sheltered by the Raja of Amarkot in Sind. In the year 1542 Akbar was born. He went to Persia and received the grace of the Shah who granted him soldiers to regain his throne. In 1544 Humayun captured Kabul and Khandar. In 1546 he lost Kabul to his brother Kamran. In 1547 he recaptured it. In 1549 Kamran occupied Khan dar. Humayun again had to fight against Kamran who was defeated and blinded. After the death of Sher shah in 1545 his son Islam Shah who ruled upto 1553. After him Muhammad Adil Shah. As a result of the onslaught by Ibrahim Shah and Sikander Shah the Sur empire was broken up. Humayun who now prepared himself to attack India reached Peshwar in 1554 and in 1555. He occupied Lahore and Dipalpur. The same year saw the battle of Machiwara against the Afghans, and the defeat of Sikander Sur in the battle of Sirhind. By July 1555 Humayun reached Delhi where he spend his time in administration of his kingdom. His son Akbar was now slowly rising to power. In 1556 Humayun died in an accidental fall. After the death of Humayun the (mughal rule) history of India saw the rule of greatest of the Mughal rulers, Akbar the great. The return of Humayun to power in 1555 was preceeded by the a period of rule by Sher Shah who established the Sur dynasty. Sher Shah was the grandson of Ibrahim Sur, who came to India and joined military service under Bahlol Lodi. Ibrahim Lodi gave the Jagirs of Sahsaram, Khawaspur and Tanda to Sher Shah. Sher Shah rose to power and had planned to join Mahmud Lodi in his attempt to revive the Afghan Empire. Circumstances were unfavourable and in 1527 Sher Shah joined the Mughal service and assisted Babur in his conquests in India. Owing to differences of opinions he left the Mughal service in 1528. In 1529 Sher Shah joined Mahmud Lodi. After Mahmud Lodi's abdication,Sher Khan captured South Bihar. In 1529 Mahamud lost the battle of Ghagra but wanted to attempt to capture power in 1530. With the help of the Afghan chiefs and Sher Shah he marched against Humayun. But Humayun proved a strong rival to Mahmud Lodi. By 1534 after the battle of Surajgarh in which the ruler of Bengal was defeated, Sher Shah became the ruler of Bihar. By 1530 Sher Shah captured the whole of Bengal. In the battle of Chausa in 1539 he defeated Humayun. In 1540 Sher Shah fought the battle of Kannauj and defeated Humayun. In 1542 Sher Shah conquered Malwa, and Raisin in 1543. He also brought Multan and Sind and parts of Punjab under him. In his attempt to defeat the Raja of Kalinjar in Budelkhand he was successful but lost his life in 1545. After his death his son Jalal ruled with the title of Islam Shah till 1553 AD. Islam Shah destroyed the Afghan nobles whom he did not trust. This ultimately led to the downfall of this empire. Islam Shah was succeeded by his son Firuz who was put to death by Mubariz Khan, the son of Sher Shahi's brother and the brother of Firuz's mother. Mubariz Khan took up the title of Muhammad Adil. He was not a capable ruler. His minister Hemu who was appointed by him rose to importance. Hemu was defeated in the second battle of Panipat and killed. After Hemu the empire witnessed a struggle for independence between five Afghan kings namely Muhammad Shal Adali, Ibrahim Sur, Ahmed Khan sur, Muhammad Khan and Daulat Khan. This internal strife proved advantageous for Humayun who defeated Sikandar Sur and caused the end of the second Afghan rule.